Not only is your Gourmet BBQ System Pizza Stone good for pizza, it is there for dessert too. Using the Pizza Stone on the Weber Summit Charcoal Grill lets you feed the whole family an amazing pizza pie while continuing the fun with the kind of pie we all look forward to after dinner! 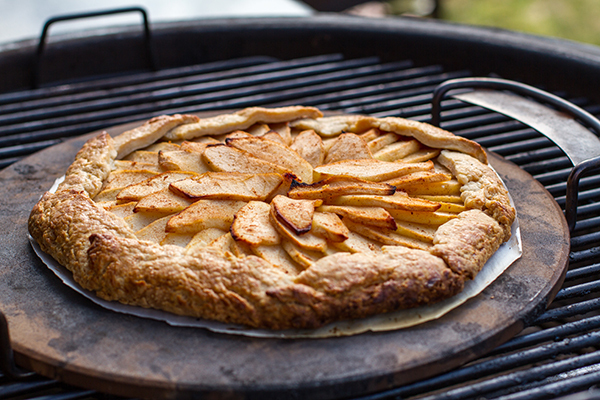 Satisfy your sweet tooth with a light and flavorful Apple Galette everyone can enjoy. You can use the Gourmet BBQ System Pizza Stone on many of our gas and charcoal grills, but all the extra grilling area on the Summit Charcoal Grill allows you to grill some of your favorite extra toppings and please all your friends and family. 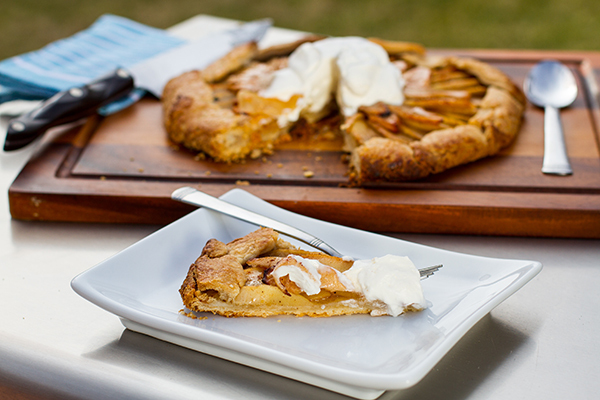 To top off your perfect evening, check out the recipe for delicious Apple Galette below. 1. In the bowl of a food processor fitted with a steel blade, pulse the flour, sugar, and salt to combine, 2 to 3 times. Add half of the butter. Pulse until the dough resembles coarse meal, 6 to 8 times. Add the remaining butter and pulse until the pieces are pea-sized, 6 to 8 times. Transfer to a medium bowl. Sprinkle in the water while stirring and fluffing with a fork. Continue to stir and toss with the fork or your fingers until the dough comes together. A small handful of dough squeezed gently will hold its shape. Dump the dough onto a lightly floured, smooth surface. Gather the dough into a ball and then flatten into a disk without over-handling. Pieces of butter should be clearly visible. Wrap in plastic wrap and refrigerate at least 1 hour or up to 24 hours. 2. On a piece of lightly floured parchment paper, using a floured rolling pin, roll out the dough into a 12 to 13 inch diameter circle, lifting and turning the dough as necessary. If the dough forms any large cracks, push them back together and roll over the repairs to secure them. Slide the dough and parchment onto a rimless baking sheet and refrigerate while you preheat the grill and prepare the apples. 3. Remove the circular Gourmet BBQ System™ grate insert, and prepare the grill for indirect cooking (see page 13) over medium-high heat (as close to 400°F as possible). Preheat the pizza stone for approximately 15 minutes. 4. In a large mixing bowl, stir together the sugar, lemon juice, cinnamon, and nutmeg. Peel, quarter, and core the apples. Cut into slices no larger than ¼ inch. You may cut these in any direction, but lengthwise slices are most attractive. Add the apples to the sugar mixture and toss to coat thoroughly. Remove the dough from the refrigerator. Starting with the outside of the circle, arrange the apples in a flat, concentric, overlapping pattern, leaving a 1½ inch border. If any apples are sticking up perpendicular to the rest, flatten them out to prevent their edges from burning. Fold the dough border over the outer edge of the fruit, pleating as necessary. Brush the crust with the cream using a dabbing technique. Try to keep the cream from dripping down and collecting at the lower edge of the galette because it tends to burn while cooking. Transfer the pastry and parchment paper to a rimless baking sheet or pizza paddle. 5. Trim the overhang of the parchment paper about even with the galette. Slide the galette with the parchment onto the pizza stone. Grill over indirect medium-high heat, with the lid closed for 50 to 60 minutes; turning the galette once or twice to ensure even cooking. When crust is crisp and deep golden brown, and the apples are very tender when poked with a sharp knife, remove from the heat and slide the galette, without the parchment paper, onto a rack to cool slightly. 6. In a small saucepan over medium heat, or in a small, heatproof bowl in the microwave, heat the honey until it is runny. Brush and dab the honey over the apples. 7. In the bowl of an electric mixer, whip the cream on high speed until traces of the whisk or beaters appear. The cream will be thick, but not yet firm enough to hold any peaks. Add the Calvados and honey. Continue to beat the cream until soft peaks form. 8. Cut the galette into slices and serve warm or at room temperature with whipped cream.